What’s up gang! So here it is, another Monday morning, with the chance to start the week off right with more bloggy goodness. And what’s better than another chapter in the ongoing saga of one man’s literary battle against a never ceasing sea of comic books. All this month I’ve been reviewing supernatural and horror related comics as part of my celebration of all things spooky in honor of Halloween. So it was a given that eventually I’d get to a Hellboy comic, right? I mean Mike Mignola’s most famous creation and the universe of other characters it has spawned is simply legendary among both comic and pop culture fans alike. Star of two major motion picture releases, with a reboot movie coming on this upcoming January, this horned demon turned good guy and ultra unnerving Lovecraftian mythology built up around him is the perfect character to do one of these themed read piles about, right? Eh. Well you are in the ballpark at least I guess. I mean don’t get me wrong. The Ghosts of the Stratosphere will be covering a Hellboy book before the Halloween season is over, it’s just we already got it on schedule to do Mignola’s “Right Hand of Doom” on our podcast proper for our big Halloween extravaganza on October 30th (remember to subscribe on iTunes, Google Play, TuneIn, Stitcher, and YouTube so you don’t miss it). However, instead of Hellboy exactly, I thought I’d do a review of a story written about the second most important “monster” working at The Bureau for Paranormal Research and Defense (or B.P.R.D.). 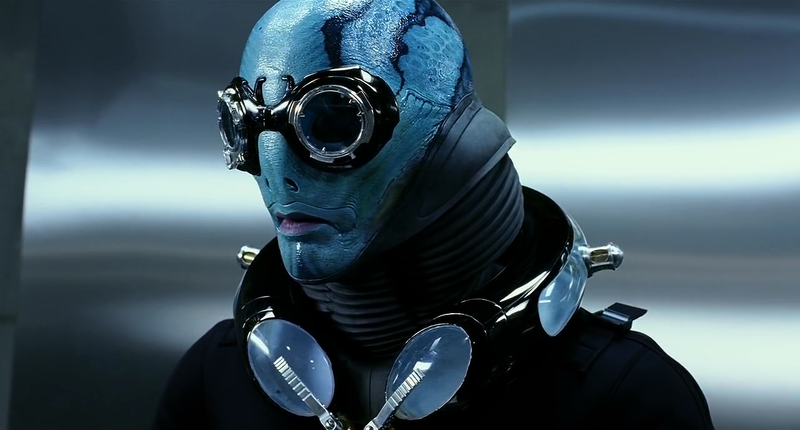 Yep, that’s right our fishy friend himself Abe Sapien. I won’t lie, sometimes when it comes to the Hellboy universe, I sort of find some of the supporting characters to be actually more interesting than Hellboy himself. I sort of wrote about this at length with my review of Lobster Johnson earlier this year, but even more than him, I’ve been extremely fascinated with the character of honest Abe. Every since I first saw him in the Hellboy movie, with the Doug Jones body capture and the David Hyde Pierce voice, I said to myself, if there’s anyone that could rival Hellboy in that cool yet creepy department, it’s definitely this guy. I almost feel as if he’s also the “hipster” choice of Hellboy characters. He’s the more geeky, book smart tactician with his svelte body and intellectual demeanor. He looks like he listens to Indie rock, cold brews his coffee, and sports a handlebar mustache when he’s not saving the universe from ungodly evil. Plus, he’s blue/green and that’s so much more of a soothing color than beet red, don’t ya think? In any case, if I was going to start with a Abe Sapien story, I thought it best to go with “The Drowning” which is pretty much his first solo field assignment for the BRPD away from the babysitting of Hellboy. Set in the year of 1981, only 4 years after his “birth” from the suspended animation tank he had been trapped in since his creation way back during the American Civil War, we are introduced to an Abe Sapien who is very unsure of both himself and his role in this world. Being somewhat of a unique freak of nature aside, he’s a character that spends a lot of his time lying in his water tank reading books, which somewhat further isolates him from the rest of humankind. However, with Hellboy on somewhat of a permanent hiatus at this time, he is suddenly thrust into being the BRPD’s number one “superhuman” asset and Professor Broom sends him on what should be a fairly routine extraction assignment to collect a demon killing dagger that was lost when paranormal investigator Edward Grey fought and destroyed a powerful warlock off the the little fishing island of Saint-Sēbastien. Unfortunately, like so many “routine mission” stories in literature, there’s noting routine about it at all as things quickly escalate as ancient evils come are awakened by the expedition and end up killing nearly the entire village including the other human agents that were sent to help Abe on this mission. Of course then conveniently, Abe’s radio stops working so he can’t call for back up and thus our hero is left alone to fend for himself on an isolated island filled with horrible soul eating creatures. 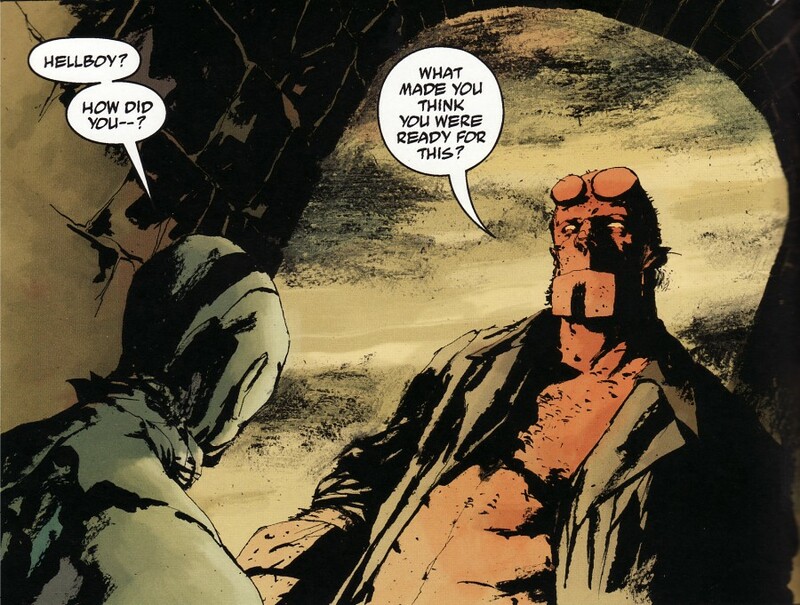 From a narrative textbook, it’s pretty much textbook trope for a hero’s “baptism of fire” as it were, complete with moments in which Abe hallucinates seeing his former babysitter, Hellboy, who has come to mock him for being in way over his head. It’s again just illusions born of panicked insecurity (and some demonic possession), but it works in breaking Abe down to his lowest point so he can build himself back up again in true “hero journey” fashion. Joseph Campbell would be so proud! From there, Abe has to survive long enough to piece together the clues surrounding where these demons came from and what can stop the resurrection of this evil warlock which the dagger bonded to death so many years ago. However, until some Hellboy stories, he relies much more on his intelligence and cunning than brute strength to outwit his demonic pursuers. No better example of this is his realization that although he is ill equipped to deal with his threat, that there are resources on the island which can. Mainly, he allies himself with a strange old witch hag who seemingly was killed by the demons during the initial attack on the village, but still contains powers from beyond the veil which with Abe’s help could be awakened to battle with the warlock. Now most of the story with the hag and her history with the island shows Mignola’s preference to aping Lovecraftian horror directly as most of it a direct homage to the famous short story “The Shadow over Innsmouth”, what with timeliness unholy sea gods and the like. In fact, once the warlock’s story is also revealed, it too seems ripped directly from some Lovecraft tale as well mixed a little from Robert E. Howard of Conan fame. Yeah that’s really a giant eel trying to constrict to death a red man/octopus monster while they fall hopelessly to their deaths after smashing through the remains of a Catholic church that was converted into a house of worship for the almighty Sea gods. Yep, you don’t see that every day, Charlie. You surely do not. In closing, I am a big fan of the way that Mignola writes Abe in this book as ultimately not the hero that saves the day, but again like a lot of Lovecraft stories, the character that manages to survive longer than others in order to bear witness to some cosmic climatic battle between forces far beyond our understanding. It’s refreshing to read superhero stories in which the superhero is way out of their depth, and wrestles with his or her own frailties before coming to some level of acceptance and persevering past them. That’s what makes true heroes, those that understand the building is burning, and there’s nothing you can to do to stop that. Yet perhaps there’s something that can be saved from the inevitable destruction and that’s worth rushing into despite the chances you might not come out the other side. So kudos to Mr. Mignola for deciding to tell a story which lays bare our aquatic champion with all his weakness and self doubt, yet in coming through all of it, makes him a stronger person that’s more humble and accepting of those things in the universe that are far beyond his ability to change. The art is not provided by Mignola but instead Jason Shawn Alexander, who does his best to ape Mignola, but never quite captures the same freaky almost gaunt-like intensity that you get from Mike’s stuff. It’s much more softer lines and shading which is serviceable, but gosh if you don’t end up feeling just a little bit cheated at times that we got somewhat of a substitute teacher for this lesson, instead of the professor of “Eerie”nomics that we signed up for. Still though, its perfectly fine art on it’s own merits, and if you were new to the comic scene that just thought of Mignola as a writer, you probably would be completely satisfied by it. Again, I know it’s unfair to Mr. Alexander, but if you draw a Hellboy related book and Mignola is anywhere near the project, you are going to get unfair comparisons to his work for no other reason than he’s in the same room. You just gotta accept that and move past it. 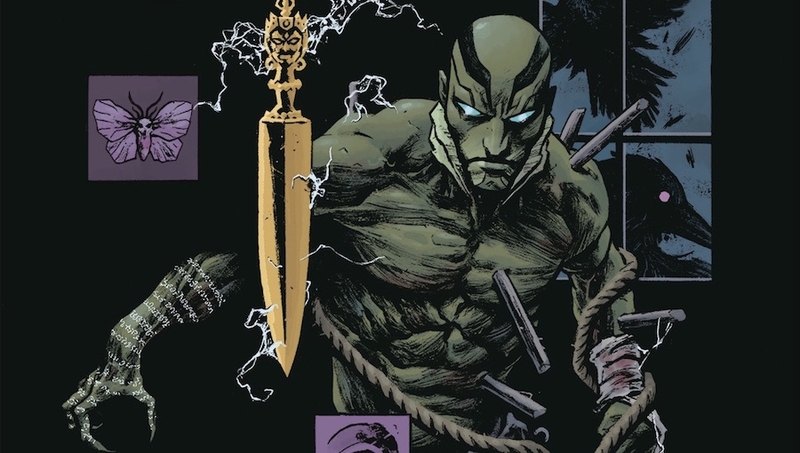 Overall though, Abe Sapien is an interesting enough character on his own and he’s surprisingly easy to root for as a hero despite his alien appearance. Plus, the tale is again well rooted in a very classic retelling of those age old horror stories of the lone survivor struggling against a mob of ungodly forces bent on claiming their last victim. So this Halloween, treat yourself and pick up this book. It’s definitely not all wet.